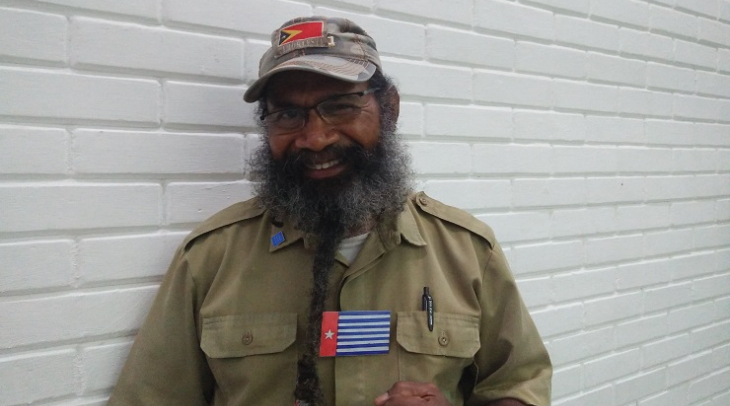 In Jakarta, KBR Radio spoke with former political prisoner, and Papuan activist Filep Karma. This week, Indonesians are celebrating Independence Day. On 17 August 1945, the nation won independence, after more than 300 years of Dutch rule, and a short period under Japanese occupation during World War II. Every year, the country is covered in red and white national flags. Neighbourhoods gather together and play games, from sack races, to contests up climbing giant poles, and races to eat huge crackers, a favourite Indonesian snack. In the far eastern corner of the country, some in the resource-rich Papua, are agitating for independence from the rest of Indonesia. Filep Karma dresses in an olive green Safari suit. His dreadlocked beard reaches from his chin down to his belly. The Morning Star flag is prominently displayed across his chest. That’s a bold move. The Morning Star flag is the symbol of Papua’s struggle for independence from Indonesia. In 2004 Karma was sentenced to 15 years in prison for peacefully raising the flag. Under Indonesian law, it’s still a crime to raise the flag. Without that freedom, Karma says he won’t be celebrating Indonesian Independence Day. Papua is in the far eastern side of Indonesia. When Indonesia won independence in 1945, Papua remained under Dutch control. In 1963, Indonesia seized control of the area. Papuans were promised a referendum, where they would be able to choose between independence and being part of Indonesia. The referendum took place in 1969, but only a small number of Papuans were allowed to vote – just over a thousand- and it was under the threat of violence. Since then, Karma says Indonesian rule has been brutally enforced. “Ever since we were forced to join Indonesia, we can be killed whenever the police and military want,” Karma stated. Just earlier this month, Indonesian paramilitary police opened fire on a group of demonstrators on two occasions, killing one, and injuring 16 others. The demonstrators were protesting the death of their friend, who after being pulled from a river, nearly drowned, died before getting medical care. Indonesian workers in the area refused to use their vehicle to transport him to hospital. The delay proved fatal. Karma says this isn’t out of the ordinary. It’s part of a much larger pattern. Andreas Harsono, of Human Rights Watch Indonesia, agrees that Papuans, especially outspoken ones, face ongoing violence. “Many of them were beaten, many of the women were raped, sexually abused, children also abused, under Indonesian hands. Many of their leaders harassed, intimidated, some were killed,” Harsono explained. “Disappearances was a major problem amongst Papuan activists, many of their leaders if they want to save their lives they have to do it overseas, whether in Papua New Guinea, or Vanuatu Islands, or Europe and the United States. Australia too,” he concluded. Papua is home to the world’s largest gold mine and third largest copper mine. But despite the area’s rich mineral resources, Papuans see few of its benefits. The Grasberg mine is run by American-Indonesian company Freeport, and workers are brought in from other parts of Indonesia. Papuans are the poorest people in Indonesia. Indonesia’s current President, Joko Widodo, or Jokowi as he is known, has promised to improve matters by developing infrastructure, including a massive road project, the Trans Papua. But Karma has his doubts. In the meantime, Karma will continue to speak out, despite the risks. And he says he’s still waiting for Jokowi to fulfill the promise he made in his first few months as Presiden: To end human rights violations in Papua.